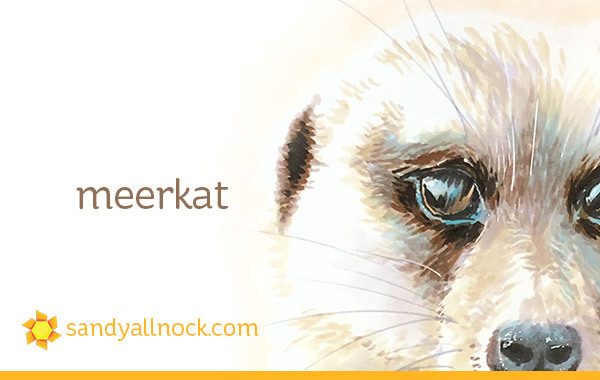 A little bit of art today with meerkats! I’ve had a Meerkat stamp set (by Art Impressions) for months now, sitting on my desk…and it’s finally its day to shine! As I was looking at the coloring of their faces, I decided to try a sketch of one, up close, so I could study the eyes and know what to do with the card. The stamp set is drawn with whites in their eyes, which they don’t have – so this was valuable info when I colored the card. My sketch is made in a Copic sketchbook I bought before they discontinued them. It’s slicker paper than my usual Neenah. Sandy the Meerkat you sketched is absolutely amazing!! Its nose looks damp & the eyes have that shine to them & you can almost imagine seeing the reflection of what it is looking at. Your little finger has more talent than my whole body. I never thought that I would be so captivated by a meerkat! He is really beautiful. I am in awe of your skill. Thank you so much for sharing! The card is soooo cute, and I love the background, but your sketch – wow – it’s absolutely stunning. You inspire me so much Sandy! 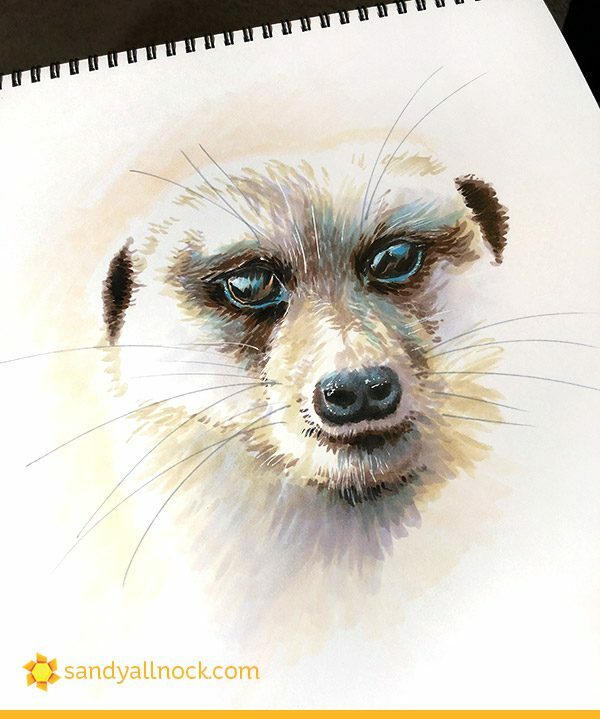 Oh wow Sandy – your meerkat sketch is just stunning! And your card is adorable! WOW! What an outstanding piece of art, Sandy! I love your sketch and the coloring of it! The Meerkat’s eyes are so stunning! The card you created is wonderful, too. Sandy, I LOVE your work. You are such a talented artist! God bless you! Sandy, your sketch is fabulous. How I admire your talent. 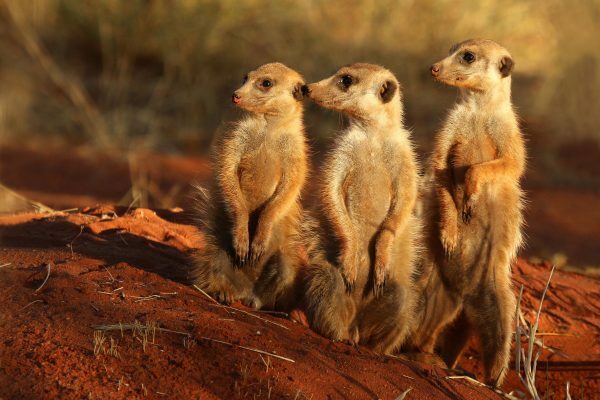 In case you don’t know about it, you might enjoy watching “Meerkat Manor”, which is a documentary that follows a group of real meerkats for 4 seasons. It’s amazing how wrapped up you can get in their lives. I watched it several years ago when it was on PBS, but you can see it now by Googling it to locate where it’s available. Your sketch is stunning Sandy! 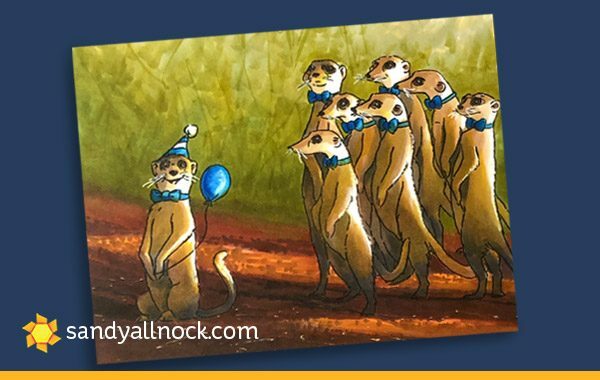 And I adore your card, those meerkats with their bowties they are great and make me laugh. Thank you so much for this gorgeous post. Your sketch looks so realistic, Sandy! The eyes draw me right in. I didn’t know AI had a meerkat image. It’s adorable! Thank you for sharing such beauty with us. I know your shadows class will be incredible! Love, love, love the copic sketch! The card is wonderful too! You have been blessed with an incredible gift from God and I am so grateful that you share it with all of us. Thank you! Recently we visited the zoo in Colorado Springs on a cold day and were privileged to see a similar group of meerkats standing in a group taking advantage of the weak sunlight. Your rendition does justice to their cuteness! Thanks for sharing! Love how you were inspired by that photo to create such a cute scene. What an adorable card. But that sketch…. such details…. wow. Love your sketch especially, Sandy! 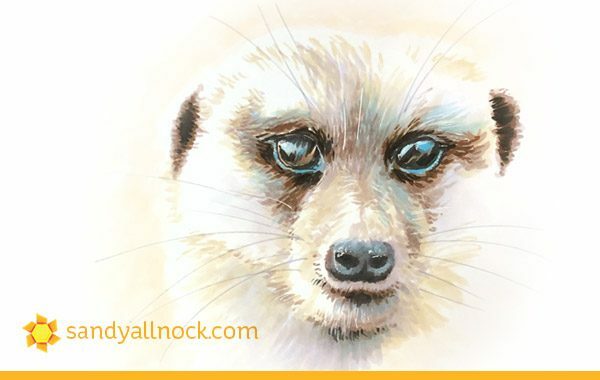 Beautiful sketch and color of the Meerkat they are so cute! You captured his cute face perfectly! this is a wonderful subject, they are so cute an your sketch is beautifully done, captured his face in such great detail. Of course the card, cute as ever an enjoy the cutie pie lower left, he says it all. Thanks for a start of a cheerful day, may yours just be as happy as ever.